Vertebroplasty and kyphoplasty are minimally invasive procedures used to treat vertebral compression fractures of the spine. These painful, wedge-shaped fractures can be caused by osteoporosis and injury. Left untreated, they can lead to a humped spine (kyphosis). By restoring the vertebra height with a balloon and injecting cement into the fractured bone, patients can recover faster and reduce the risk of future fractures. In vertebral compression fractures (VCF), the body collapses into itself (more in the front than the back) producing a "wedged" vertebra (Fig. 1). When several vertebrae become wedge-shaped, people can develop a humped spine, called kyphosis. People with bones weakened by osteoporosis (a depletion of calcium) or multiple myeloma (cancer of the bone marrow) are especially prone to compression fractures. Activities, such as lifting a heavy object, sneezing, or coughing may cause fractures. VCFs can lead to back pain, reduced physical activity, depression, loss of independence, decreased lung capacity, and difficulty sleeping. Figure 1. Side views of a normal spine and a spine with a compression fracture. 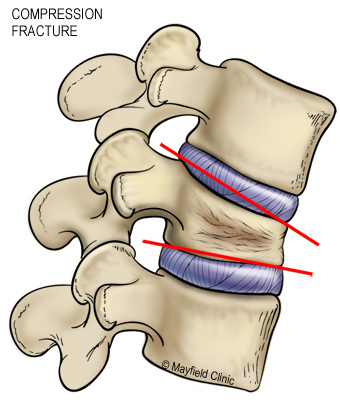 An osteoporotic compression fracture causes the front of the vertebral body to collapse in a wedge-shape (red lines). Without treatment, the fractures will eventually heal, but in a collapsed position. The benefit of kyphoplasty is that your vertebra is returned to normal position before the bone hardens. Patients who've had kyphoplasty report significantly less pain after treatment . Vertebroplasty and kyphoplasty will not improve old and chronic fractures, nor will they reduce back pain associated with poor posture and stooping forward. Traditional treatment used to involve waiting 4 to 6 weeks to see if patients improved on their own, but now it's believed that waiting allows the bone to harden, making vertebroplasty or kyphoplasty less effective. Many doctors are now suggesting vertebroplasty as soon as the first week after a fracture for some patients because the results are significantly better . The surgeon will perform a complete medical history and physical exam. Diagnostic studies (MRI, CT, bone scan) may be included in your evaluation to make a diagnosis of vertebral compression fracture. Your surgeon will also determine if your spine is "stable" or "unstable" and will discuss with you all treatment options. Minimally invasive spine surgery can be performed by a neurosurgeon, orthopedic surgeon, or interventional neuroradiologist. Many spine surgeons have specialized training in minimally invasive spine surgery. Ask your surgeon about his or her training and success rate with these procedures. You may be scheduled for presurgical tests (e.g., blood test, electrocardiogram, chest X-ray) several days before surgery. In the doctors office you will fill out paperwork and sign consent forms so that your surgeon knows your medical history (allergies, medicines/vitamins, bleeding history, anesthesia reactions, previous surgeries, etc.). You should stop taking all non-steroidal anti-inflammatory medicines (Naproxen, Advil, Motrin, Nuprin, etc.) and aspirin one week before your surgery. Patients are admitted to the hospital the morning of the procedure. No food or drink is permitted past midnight the night before surgery. An intravenous (IV) line is placed in your arm. To minimize pain and discomfort, you will be given either general anesthesia, which puts you to sleep, or conscious sedation. Under conscious sedation you are awake, but feel no pain and may have no memory of the procedure. 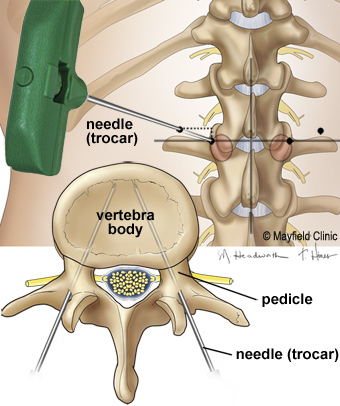 Depending on the vertebral level, a single needle may be used. The surgeon may elect to insert the needle slightly above the pedicle if the diameter of the pedicle is too small. There are five steps to the procedure, which generally takes 1 hour for each vertebra treated. You will lie on the operative table and be given conscious sedation. Once sedated, you will be positioned on your stomach with your chest and sides supported by pillows. 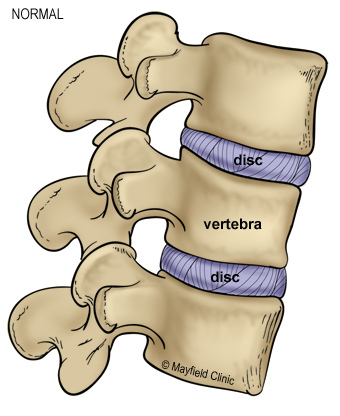 Depending on the section of the spine (cervical, thoracic, or lumbar) where the compressed vertebra is located, your back or neck will be cleansed and prepped. A local anesthetic is injected in the area where a small, half-inch skin incision will be made over the fractured bone. With the aid of a fluoroscope (a special X-ray), two large diameter needles are inserted into the vertebral body through the pedicles (Fig 2). The fluoroscopy monitor allows the surgeon to see exactly where the needles are positioned and how far they are inserted. The needles are advanced through the bone using either a twisting motion or a tapping mallet. The needles are angled to avoid the spinal cord. 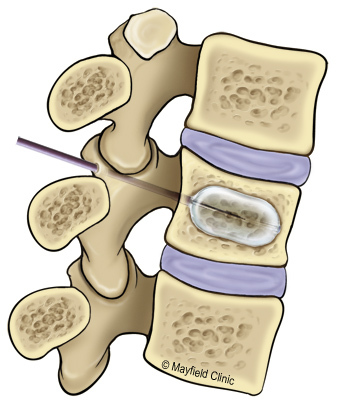 Depending on the vertebral level, a single needle may be used. Figure 2. Using fluoroscopy, the hollow needle (trocar) is inserted through the skin to a point behind the pedicle. 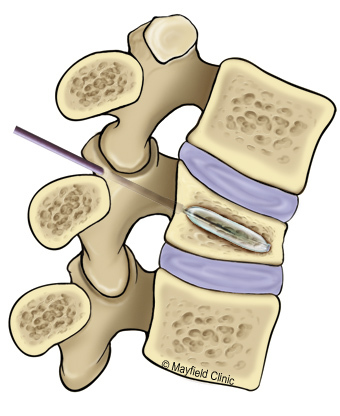 The needle is tapped through the pedicle into the collapsed vertebral body (viewed from above). If the vertebra is significantly wedge-shaped, the surgeon will insert inflatable balloons through the needles into the vertebra. To insert the balloon tamps, the surgeon first uses a drill to create a working channel. The surgeon carefully inflates the balloons, raising the vertebra back to its normal height (Fig. 3). The amount of height restored depends on the age of the fracture. The balloons are deflated and withdrawn, leaving a space in the middle of the vertebra. This procedure is called kyphoplasty because it reduces unwanted kyphosis, or forward curvature, before the bone is stabilized. Figure 3. The balloon is inserted into the working channel inside the vertebra, then inflated to raise the vertebra to the appropriate height. Bone cement is slowly injected under pressure, filling the deepest area first, then withdrawing the needle slightly to fill top areas (Fig 4). The pressure and amount of cement injected are closely monitored to avoid leakage into unwanted areas. While complete filling of the vertebral body is ideal, it is not always possible or necessary for pain relief. Figure 4. The balloon is removed and bone cement is injected into the cavity. Fluoroscopic x-ray shows cement in upper vertebra (red arrow) and needle inserted in lower vertebra. The needles are withdrawn promptly before the cement hardens. The small skin incision is closed with skin glue or steri-strips. You will not be moved from the operating table until the remaining cement in the mixing bowl hardens. You will return to the recovery area. Your blood pressure, heart rate, and respiration will be monitored, and your pain will be addressed. You'll remain lying down for the first hour after the procedure. After 1 hour you may sit up. After 2 hours you may get up and walk. Most patients stay in the hospital overnight for observation and are released the next morning. Some patients can be released home the same day. Ice your incision 3-4 times a day for 15-20 minutes to reduce pain and swelling. Do not drive for 2-3 days. Once the haziness from anesthesia wears off you can resume driving. Learn the proper way to stand, sit, sleep, and lift. (see Posture & Body Mechanics). If you have a Band-aid over the incision, remove it one day after surgery. Gently wash the incision covered in Dermabond (skin glue) with soap and water. Pat dry. Inspect and wash the incision daily. If your temperature exceeds 101.5 °F or if the incision begins to separate or show signs of infection, such as redness, swelling, pain, or drainage. If you experience difficulty walking or bowel or bladder problems. The sooner a fracture is repaired, the better the results. Vertebroplasy relieves pain in 75-90% of patients; however, it does not correct the wedge deformity, which can lead to repeat fractures. In a recent study of kyphoplasty, pain levels in patients dropped from an average of 8.6 before surgery (on a 10-point scale) to 2.1 three months after surgery . Additionally, of 51 patients who either couldn't move around on their own or required assistance to move, only 8 patients couldn't move around without assistance after three months. This reduction in pain and increased ability to move significantly improved the patients' quality of life. Other studies in cancer patients with multiple myeloma have shown similar results. Bone cement leakage. There is a slight possibility that bone cement can leak along the outside of the needle into surrounding soft tissues. This can also happen when the needle is removed from the vertebra. Cement can leak into the veins surrounding the vertebra. The surgeon closely watches the fluoroscope and stops injecting cement if this begins to happen. Cement can leak into the neural foramen where the spinal nerve exits the spinal cord. This can cause nerve pain (radiculopathy) and may require further treatment. Nerve damage. Any operation on the spine comes with the risk of damaging the spinal nerves or cord, which can cause numbness or paralysis. fluoroscopy: an imaging device that uses x-rays to view structures in the body in real time, or "live." Also called a C-arm. multiple myeloma: a cancer of plasma cells - the antibody-producing cells normally present in the bone marrow. vertebral compression fracture (VCF): a break in the vertebral body of the spine causing it to collapse and produce a wedge-shaped deformity. vertebroplasty: a minimally invasive procedure used to treat vertebral compression fractures by injecting bone cement into the vertebral body. We perform more than 100 kyphoplasty procedures to repair vertebral compression fractures each year.